Diaries were clear and May had arrived so what better than a day trip to Paris. A wander around the Left Bank, an hour soaking up the sun in the Jardin du Luxembourg and a good lunch is a pretty good way to recharge the batteries. Arriving the day after the May Day holiday meant the streets were less busy than normal. 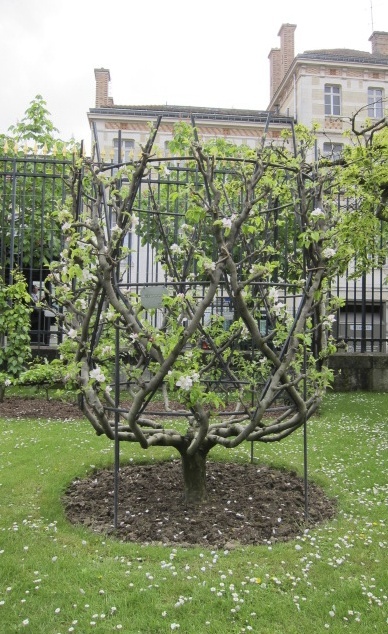 The amazing mix of apiary boxes in the Luxembourg Gardens were abuzz as the honey bees made the most of the fleeting apple and pear blossom. But where to go for lunch? Meeting up with a friend in Paris confirmed what has been talked about for sometime now - in France you can no longer take it for granted that the ingredients going into restaurant kitchens are the best, or that there is much actual cooking going on at all. Which is why it's important to treasure those who are doing it right. A visit to Les Fines Gueules in the 1st was tempting. Then again Le Cristal de Sel in the 15th is always a good bet, but maybe it was time to try somewhere new. It has long been my experience that if you take up a recommendation from the knowledgable Nick Lander you can't go far wrong, and this one was hot off the press. I've included a link to his review which, as usual, is spot on. La Table des Anges is located on my favourite food shopping street in Paris. Rue des Martyrs in the 9th arrondisement is bordered by the Gares du Nord, de l'Est and St-Lazare. Snaking uphill from Boulevard Haussmann, rue Lafitte becomes rue des Martyrs, and continues right up to the Basilique du Sacre Coeur in Montmartre. The street is lined with with good fromageries, traiteurs, boulangeries, patisseries, restaurants and cafes, including Rose Bakery. It's an easy 15 minute walk from Gare du Nord. Perfect for picking up a bit of shopping before hopping back on the Eurostar. I'm so used to walking up rue des Martyrs and turning off on Avenue Trudaine to head for the Gare du Nord that we could easily have missed La Table des Anges. Head uphill towards Montmartre and look for a very understated restaurant frontage. The owner Jacques-Henri Strauss and his small team, including Chef Yan Duranceau are genuinely welcoming. Duranceau left behind the far grander surroundings of Taillevent and Le Grand Vefour to cook at La Table des Anges. As soon as we sat down a small plate of charcuterie arrived to back up the smiles. We ate a frothy, creamy yet light Bisque de langoustine and an equally so Velouté d'asperges blanc. A cast-iron pot of Joue de boeuf topped with a julienne of vegetables was flavoured with oriental spices. The meat was meltingly tender and the rich broth demanded a spoon. A glass of Cahors went well, given that the wine was used in the dish. A large portion of Brandade was perfectly balanced and topped with deliciously gritty polenta before being lightly grilled. It was, without doubt, the star dish and a Sancerre Abbaye 2011 suited it well. Two courses were filling enough - the owner assured us he did not like people to go away hungry - but we forced ourselves to share a dish of Fraise des Anges. The glass of strawberry puree topped with a lurid green cream was, I have to say, a bit alarming. The taste was nothing of the sort. Sweet and fragrant fruit and, what turned out to be, a mint-infused cream was delicious as was a little dish of, rather too cold, strawberry sorbet. We could have eaten two courses for 16 Euros each plus wine and been quite satisfied. With one of us choosing from the à la carte and having shared a pudding, the bill came to 72 Euros including 4 glass of wine. Go to La Table des Anges expecting a good, welcoming, neighbourhood restaurant, cooking carefully sourced ingredients really well and you won't be disappointed.